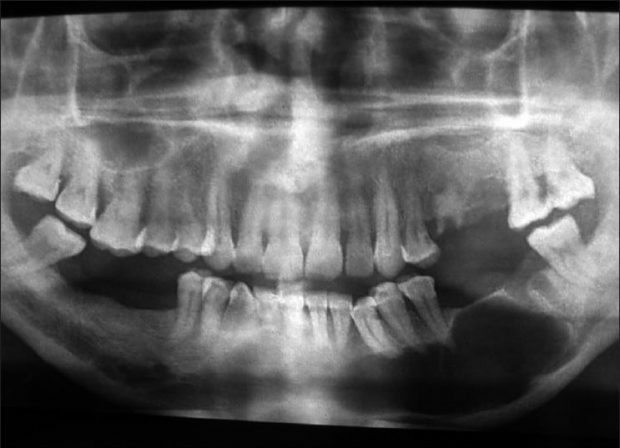 Cysts of the Jaw – Odontogenic Cysts. 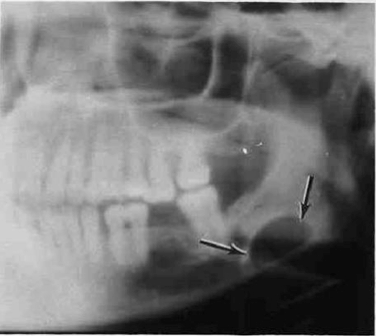 Cysts of the Jaw – Nonodontogenic Cysts. It is called Psuedocysts because they appear Radiographically as cyst-like lesion but microscopically exhibit no epithelial lining. It may occur alone or associated with other disorders of bone. Benign lesion; in maxilla , mandible or any other bones. It is a rare non-neoplastic lesion of bone of unknown etiology. It produces firm, diffuse swelling with facial asymmetry due to expansion of the bone. May be Associated with Pain. The cyst expands slowly, and sudden expansion following minor trauma is indicative of pain and bleeding inside the cyst. It may appear as a unilocular radiolucency, some cases appear as a multilocular radiolucency. A relatively High recurrent rate with simple curettage. Excision or curettage with supplemental cryotherapy is the treatment of choice. Empty Intrabony cavity that lacks an epithelial lining. The pathogenesis is not Known, It has been suggested that trauma to the bone produces intramedullary haemorrhage which fails to organise and heal and that cavitation occurs by subsequent hemolysis and resorption of the clot. Teenagers are most commonly affected. Mandible is the most common side. Simple Bone Cysts are very common lesions. Most occur in the first two decades of life, with a mean age of 17 years. The lesion shows a male predominance of approximately 2:1. The cyst arises most frequently in the premolar and molar regions of the lower jaw. The majority of solitary bone cysts are symptomless with some degree of bony expansion in some cases. Internal structures are totally radiolucent. Commonly in the Mandible especially in the Ramus of the mandible. Well demarcated unilocular or multilocular radiolucency with scalloping around roots commonly found in posterior mandible. 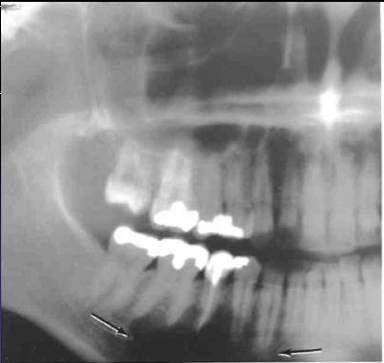 Displacement of teeth is uncommon. Surgical exploration of the area will confirm the diagnosis. Opening such cysts, evacuation of their contents and making them bleed results in healing of the cavity. Simple bone Cysts may have an appearance similar to that of a true cyst, especially an Odontogenic Keratocyst (Primordial Cyst). However, maintenance of some lamina dura and the lack of an invasive periphery and bone destruction should be enough to remove this category of diseases from consideration. The defect contains either salivary gland or adipose tissue. The cavity occurs due to a developmental (deep and well-defined) depression defect on the lingual aspect of mandible which contains a portion of sublingual or submandibular salivary gland. Asymptotic. It is found by coincidence during routine radiographic examination which occurs between the premolars and the angle of the jaw. It is Located below Mandibular canal in molar area. More Accurately, The most common location is within the submandibular gland fossa and often close to the inferior border of the mandible. 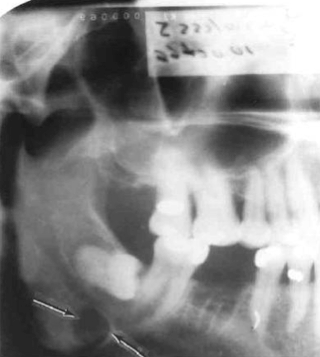 This is an uncommon developmental anomaly of the lower jaw which may be mistaken as a cyst on x-ray. sharply circumscribed oval Radiolucency beneath Inferior Alveolar Canal, with encroachment on inferior border of the mandible. Shape is round, ovoid, or, occasionally, lobulated radiolucency that ranges in diameter from 1 to 3cm Below the inferior alveolar nerve canal anterior to the angle of mandible, in the region of the antegonial notch. The margins of the radiolucent defect are well defined by a dense radiopaque line, Discrete corticated margin. This cortical margin usually is thicker on the superior aspect. No biopsy or Treatment is required. Static bone cyst is a well-defined cyst-like radiolucency with a radiopaque border. Its characteristic location is near the angle of the mandible, inferior to the mandibular canal. 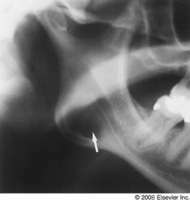 Stafne bone cyst near the angle of the mandible, inferior to the mandibular canal.